Faith’s Hall of Fame | Joe Quatrone, Jr.
“Now faith is confidence in what we hope for and assurance about what we do no t see. This is what the ancients were commended for” (Heb. 11:1-2). Hebrews 11 has been called faith’s hall of fame. Some of the people named experienced outstanding victories, but others were severely mistreated, tormented, and even killed. The people whose stories are recounted were all men and women of faith; they were all confident and certain about something. As the author of Hebrews recites the experiences of some of our favorite Bible characters, along with some of the most spectacular events recorded in Scripture, it becomes evident why these ancient men and women were so confident and certain. They were confident because they received a promise from God and were certain God would do exactly what He promised. That is the essence of faith – confidence in the promises of God. The term promise, or some derivative, appears eighteen times in the book of Hebrews and seven times in this chapter alone. What is the significance of that? Faith and the promises of God go hand in hand. Where there is no promise, there can be no faith – only hope. Every person mentioned in this chapter was given a promise by God and their faith was grounded in God’s promise to them. Living by faith requires we become familiar with God’s promises to us and then live as if He will keep them. The Bible is filled with promises for believers. Nothing is more encouraging to our faith than reviewing His promises to us regarding our forgiveness, protection, relationship with Him, and future inheritance He is preparing for all His children. 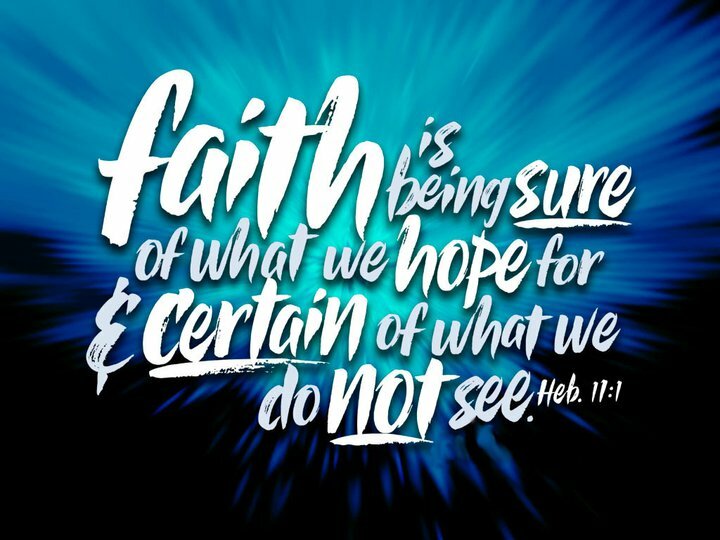 Just like the men and women of faith in Hebrews 11, we too can be confident and certain God will do what He promised! This entry was posted in Topical and tagged Bible, Certain, Confidence, Devotions, Faith, God, Hebrews, Hope, Promise. Bookmark the permalink. Living by faith requires we become familiar with God’s promises to us and then live as if God will keep them. Such an important question to ask! Excellent take on Hebrews 11! I enjoyed this post very much. I would post that post again! Awesome Joe! I am standing in His promises! Thanks for your wise words! It’s all about Him! Hi Joe – I like your discussion here on this verse from Hebrews. There are so many things in the universe that we cannot experience with our senses – but it doesn’t mean that they don’t exist or that they don’t impact us (or the world) in some way. I don’t think this topic can ever be discussed enough, and we have to continue to display God in our lives so that we can support one another. Last thing, the “myth” topic that you kicked off this week is great. You spoke about Christians being perceived as judgmental and how that can leave a bad vibe out there for critics and/or non-believers. It is important that we each analyze our motives in our relationships and our reasons for confronting one another. God expects us to be careful of the things we do in His name. I love these thoughts about faith! Awesome awesome!!! Good post! I love that faith and God’s promises go hand in hand. My faith, holding hands with God’s promise. Awesome picture. Thanks! Sorry it took me so long to respond! Thanks, Carley! Sorry it took me so long to respond! I found this very encouraging! I’ll be reading more of your writing! Keep hammering this nail, Joe. Whatsoever is not of faith is sin. Without faith it is impossible to please God. Faith comes by hearing the message and the message comes by the Word of Christ. This is the work of God, that you faithe in the One whom He has sent.